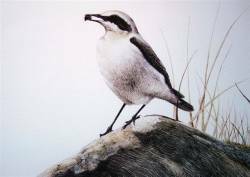 Wheatear by Nicholas Day Now you can own a signed limited edition print, (only 50 printed), by a successful Wildlife Artist using an original medium. At an affordable price! Image shown ,"Northern Wheatear On Rock"in an acid free mount.Size of the print is 12" by 15"(38cm by 30.5cm)This is signed and numbered limited edition of 50 only.Printed to a very high resolution and standard, on superb quality paper with fast inks to guarantee total colour strength for at least 80 years under normal conditions.You will be very impressed with the price and the quality of this mounted print. The wheatear is a small mainly ground-dwelling bird. It hops or runs on the ground. It is blue-grey above with black wings and white below with an orange flush to the breast. It has a black cheek. In flight it shows a white rump and a black 'T' shape on its tail. It is a summer visitor and passage migrant. Birds breed mainly in western and northern Britain and western Ireland, although smaller numbers do breed in southern and eastern England. It winters in central Africa. Where does it live? Breeding, Rocky and stony places, upland pastures with dry-stone walls and on moorland. In lowland areas, also on short grassland. Wintering Central Africa Passage Widespread, stopping in open places, often near the coast. Where to see it In the breeding season, best looked for on upland suitable habitat in northern and western Britain. May be seen on passage at coastal migration watchpoints and inland. What does it eat? Insects and larvae. What does it sound like? Its main calls are a harsh ‘chak-chak’ or 'weet-chak-chak'. It also has a brief song of melodious warbling notes, harsh scratchy sounds and whistles. To A Buy "Northern Wheatear On Rock"